Like most Torontonians in February, I’m sick of winter. The wind is biting, the ice is life-threatening, and the TTC is late. (Although, let’s be real, that happens regardless of the season.) With the shorter winter days, it’s hard not to feel as if the city’s constantly shrouded in darkness, shivering in our Timberlands as we bitterly pine for summer. In these hollow months following Christmas and New Years, it seems as if there isn’t anything else to do but wait for the warmth to return. But in the midst of the dark and the cold and the slush, the Toronto Light Festival glitters in the snow, a glow of beauty during this year’s unforgiving winter. Now in its third year, the Festival was initially formed to with the intention of being a positive urban oasis for the people of Toronto, a place for creativity to flourish despite the cold winter season. 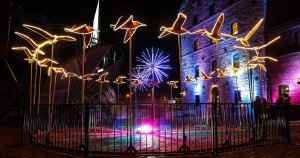 Throughout the walking streets of The Distillery District, the various light art pieces create a stunning visual journey against the backdrop of the cold city night. Penta-Or​ by Israeli artist group ENA transforms one particular street into a stunning vortex of over 75 meters of LEDs. ​Error 101​ by Sofya Batsova is a glowing artistic representation of the relationship between machines and humans. 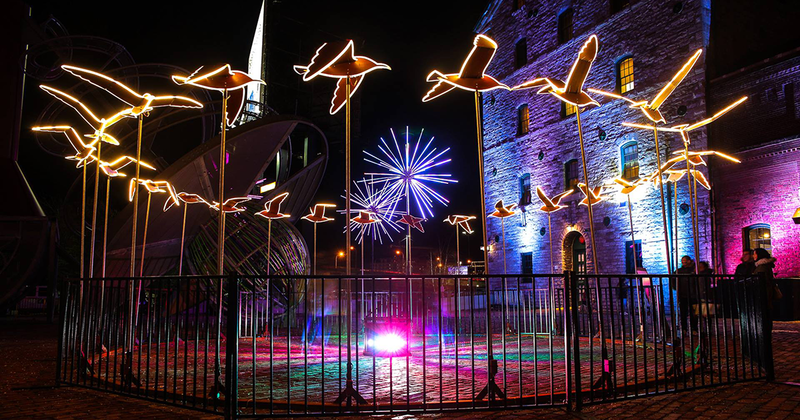 The striking silhouettes of lit-up birds flock above the heads of passers-by. A colourful LED rainbow playfully arches over a sidewalk. As I walked the streets of The Distillery District last week, my thoughts of the cold slipped to the back of my mind, replaced instead with wonder. The Toronto I knew during February — the snow-ridden, cold wasteland — melted away, transformed into a brilliant canvas of creation with each artwork I passed by. If you, like me, find yourself getting dragged down by the weather lately, I encourage you to visit The Distillery District. And maybe you, too, will find a rekindled admiration for the city.